Today, the Amy Gillett Foundation is piloting a new truck driver training program on how to share the roads safely with vulnerable road users, Sharing Roads Safely, for the first time. 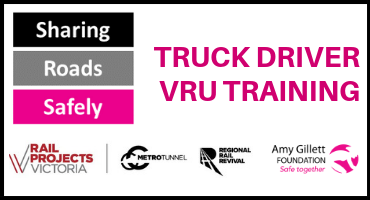 The training program, designed to increase truck driver awareness of vulnerable road users, has been developed by national cycling safety charity, the Amy Gillett Foundation, for Rail Projects Victoria in consultation with the heavy vehicle industry, road safety experts and vulnerable road user groups. Once finalised the training program will be delivered to heavy vehicle drivers involved in major rail and road infrastructure projects in Victoria, including the Melbourne Metro Tunnel Project and the Westgate Tunnel Project. “Major infrastructure projects will help to keep Melbourne moving. But we need to make sure that we keep everyone safe in the process”, said Phoebe Dunn, CEO of the Amy Gillett Foundation. “Sharing Roads Safely combines international experience with local content to deliver a best practice program specific to Australian roads”. The program combines online content with classroom activities and a practical on-road component including truck drivers riding bicycles, including e-bikes. “Getting truck drivers out of the classroom and on the road is a key part of the training. It gives first-hand insights on just how vulnerable people are when they’re on the road cycling and walking” said Jamie Ross, Director Safety, Rail Projects Victoria. The program has been informed by successful driver training programs in the UK, the Netherlands, Sydney and New Zealand. AustCycle trained coaches from Wheel Women will lead the on-road ride. With major infrastructure works being rolled out across Victoria, it is estimated that there will be more than a million extra truck movements over the next 5 years. Sharing Roads Safely is designed to support efforts to ensure all road users stay safe. An awareness campaign focused on the role of vulnerable road users in supporting road safety efforts is also under development. Feedback from the pilot will inform the final product, to be rolled out over coming months. The Australian Road Research Board (ARRB) will be the Amy Gillett Foundation’s delivery partner for the training, together with AustCycle trained coaches, to be conducted at their new premises in Port Melbourne. Find out more about the training here. Best practice training program for heavy vehicle drivers in Victoria. Based on national and international experience, with local content. This is a defining moment for heavy vehicle driver education in Australia and is a vital component of keeping all road users safe during this time of unprecedented growth and construction activity within Melbourne CBD and Victoria’s regional centres. We’ve consulted with the heavy vehicle industry, road safety and education experts and vulnerable road user groups to create this best practice package. Feedback from the pilot will inform the final product, which will then be rolled out to heavy vehicle drivers involved in major infrastructure projects across Victoria. Truck drivers play a vital role in the development of our cities with the major infrastructure projects in and around Melbourne. This training program supports efforts to ensure this activity occurs as safely as possible. Awareness and education are the keys to behaviour change – these heavy vehicle drivers will be/are now best equipped to take this newfound knowledge and awareness to the streets. We believe the real learning today comes from drivers switching places with a cyclist and pedestrian to get their first-hand perspective. This training will help to save lives by equipping drivers with important skills on how to share the roads safely with vulnerable road users.